Olinde's furniture has been serving the great people of louisiana for over 100 years with the best furniture and the best service in town. Here at olinde's furniture, we pride ourselves at being a local business with unbreakable ties to the baton rouge and lafayette, louisiana area. At olinde's furniture, we pride ourselves, on selling great products at great prices. Our customer service is available monday through saturday and they stand ready to assist you with all of your after purchase needs. We serve the baton rouge and lafayette, louisiana area with the best customer service making us the best louisiana furniture store. Olinde's furniture offers baton rouge and lafayette, louisiana area the best selections of living room, dining room, bedroom, home office, and entertainment furniture along with electronics and mattresses possible! 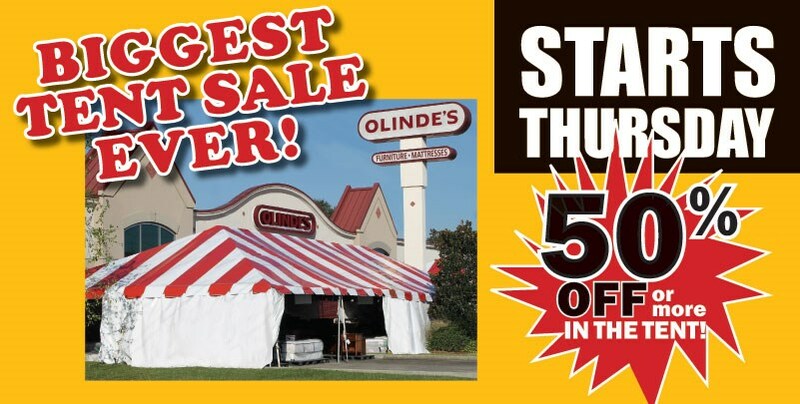 With the best quality furniture and unbeatable prices, olinde's furniture is the louisiana furniture store. Stop in today!